Tell Us Something - "Work"
Montana's premier storytelling event arrives in Butte, America for a night of true personal stories shared live and without notes. 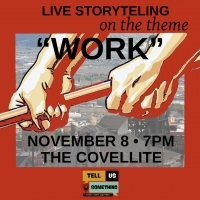 8 storytellers share their 10-minute story from memory on the theme "Work". Tell Us Something awakens imagination, empowers storytellers and connects the Butte community through the transformative power of personal storytelling. It is a celebration of each other, our stories and how we move through the world together. All of the stories at Tell Us Something are true.